A padded harness that is easy to put on and comfortable to wear. The harness comes with adjustable neckline and chest, which ensure that the harness fits well. Thanks to the two quick buckle closures, the harness is fast and easy to put on. The wide chest part of the harness feels comfortable against the dog and distributes the pressure equally across the dog’s chest. 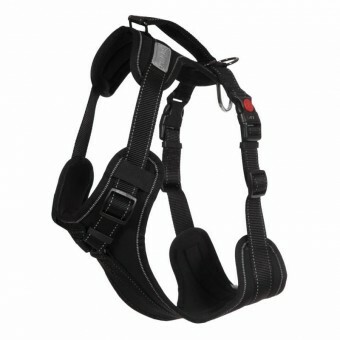 A wider chest part to ensure that the harness stays in place in all conditions, also in activities of higher intensity. Several attachment points for the leash. There is a grab handle on the back for extra control of the dog in demanding situations. Thanks to the adjustability, the comfortable and durable harness is suitable for a puppy, too. The machine-washable harness has reflective stitching and logo.